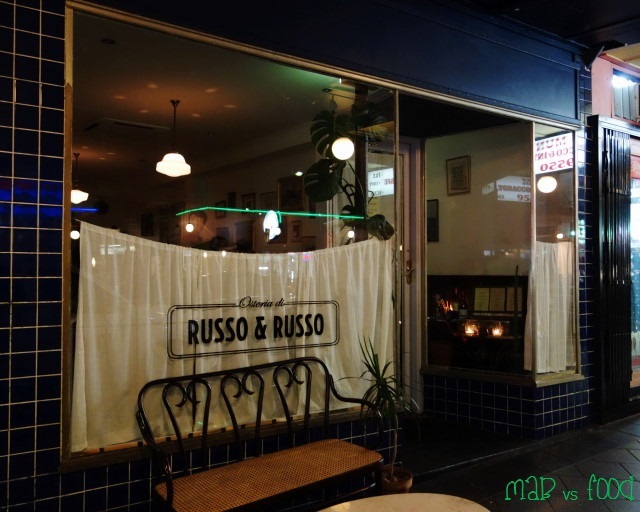 My wife decided to surprise me last night by taking me to the modern Italian restaurant, Osteria di Russo & Russo (158 Enmore Road, Enmore). 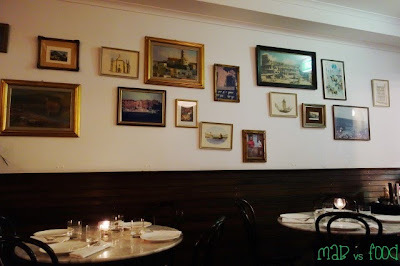 Osteria di Russo & Russo is a restaurant that has been on my radar since it opened this year and after seeing Terry Durack’s review in the Sydney Morning Herald. I always seem to be walk pass Osteria lately too as it is near Enmore Theatre and Cow and Moon Gelato, so I knew I wanted to eat here, just didn’t expect it to be so soon. The CV of the head chef also caught my attention. The head chef, Jason Saxby, is a talented young chef that has had extensive experience in top fine dining kitchens in Sydney and globally. The 2011 winner of the SMH Good Food Guide Young Chef of the Year award has worked at Quay, Pilu and Bridge Room in Sydney and at Thomas Keller’s Per Se in New York (a 3 Michelin star restaurant and 11th best restaurant in the world on the San Pellegrino list) and Australian Brett Graham’s The Ledbury in London (a 2 Michelin star restaurant and 13th best restaurant in the world). Behind those white lace curtains is a dimly lit dining room with an old Italian setting. 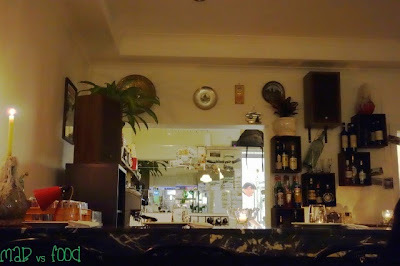 The space is tiny and the seating is very intimate and cosy. Watching the waitstaff maneuverer their way around this tight space when it’s a full house (which is usually the case given the restaurant can barely fit 30 diners) and not run into one another is an interesting sight to see. 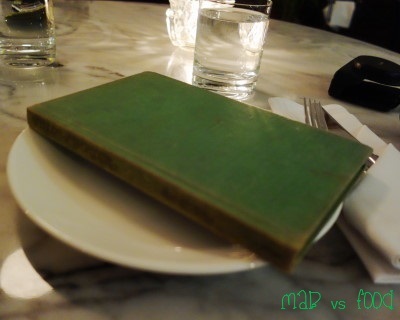 What I found to be a nice (and original) touch was that the menus are stuck onto second hand books. The courses are designed to be shared, with our waiter recommending that 4 savoury courses be shared between 2 people (given that my wife is vegetarian, we decided to order our own courses). The book starts off with lighter meals, with more substantial courses coming later as you flick to the next page and finishes off with desserts (obviously). 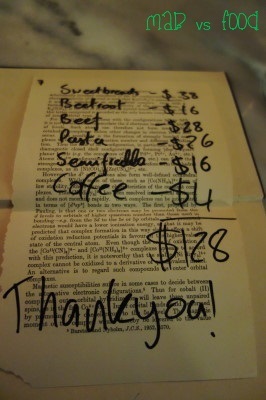 And the bill comes out to you on a page torn from a book at the end of the meal too! 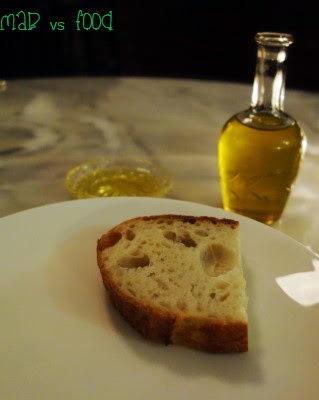 Before our meal, we had some sourdough and rye bread from Bread and Butter Project with extra virgin olive oil for dipping. The rye bread was the preferred bread. 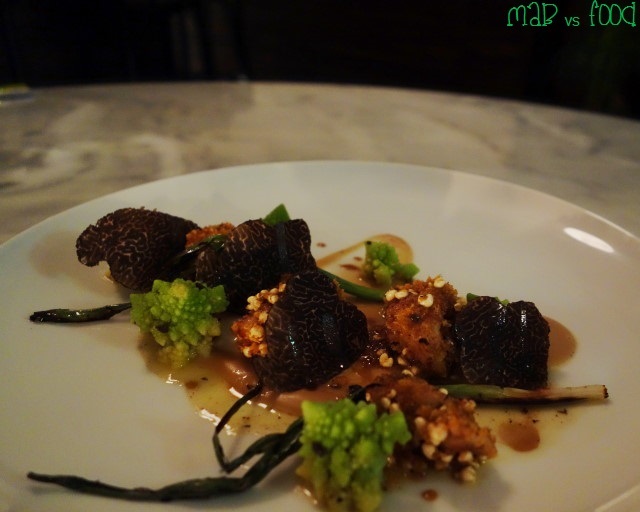 Our waiter tempted me with the special course of the night, veal sweetbreads with WA truffles, and I was sold the moment he said truffles from Western Australia. Truffle season is almost over for 2013, so I need to enjoy this wonderful ingredient whilst I can. I enjoy eating offal too when it is cooked well. And was I happy that I ordered this dish (even if it did cost a bit more than the other entrees)! This was a cracking dish and was my favourite of the night. 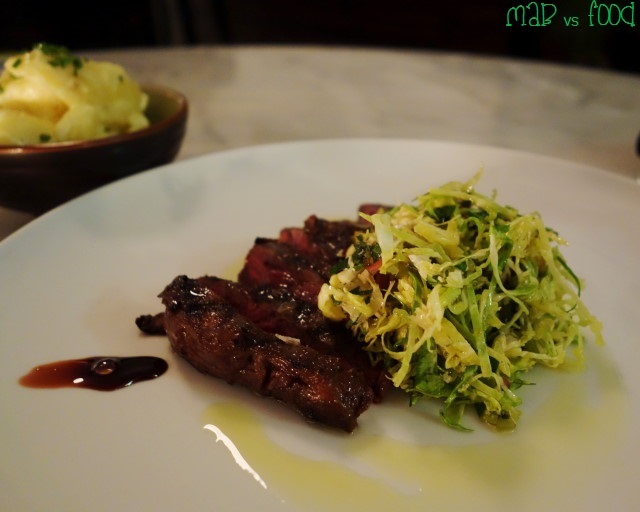 I was captivated the moment the dish was brought to our table by the sight of those slices of truffle sitting next to the sweet breads and by that wonderful, earthy aroma of truffle. I just love the way how the smell of truffle is so strong and immediately awakens the senses. The smell of the truffle was so strong that when I walked past the bathroom later in the evening, I could detect the smell of truffle wafting out of the kitchen! The sweetbread was cooked very well and was very enjoyable. It was soft and moist on the inside and crisp on the outside from the crumbed chestnuts. The combination of flavours from the sweetbreads, the chestnut puree and the truffle was a winner for me. The only problem for me was that it was all over too soon. My wife’s entrée, the salt baked beetroot, was also an excellent dish and was my wife’s favourite of the night. I tried some of it and I was equally impressed. 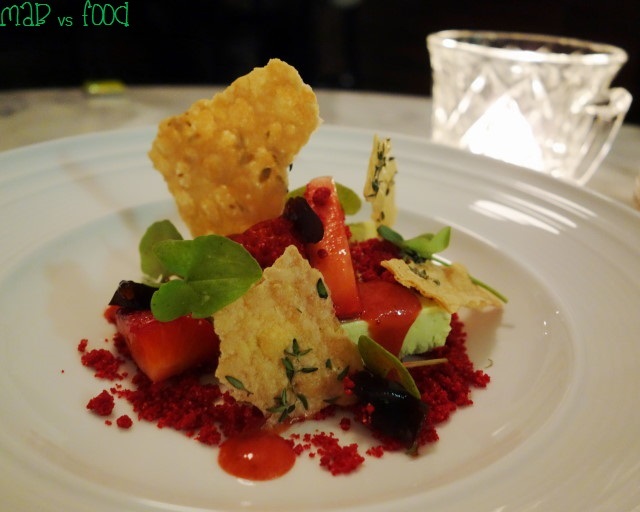 It was a visually stunning dish with eye popping colours. And all the flavours and textures come together nicely. 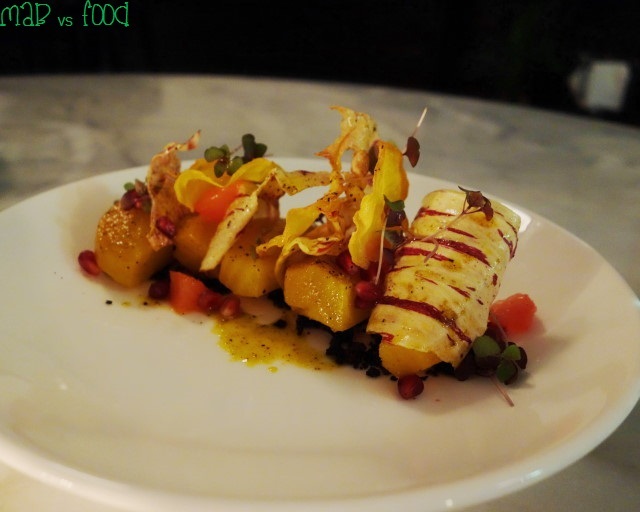 The golden beetroot were sweet, earthy and well cooked. The ruby grapefruit and pomegranate provided nice pops of sweet and sour notes. And the potato and radicchio crisps are fancy chips that are a delight to eat. My wife’s pasta dish was probably the least favourite course of the night. 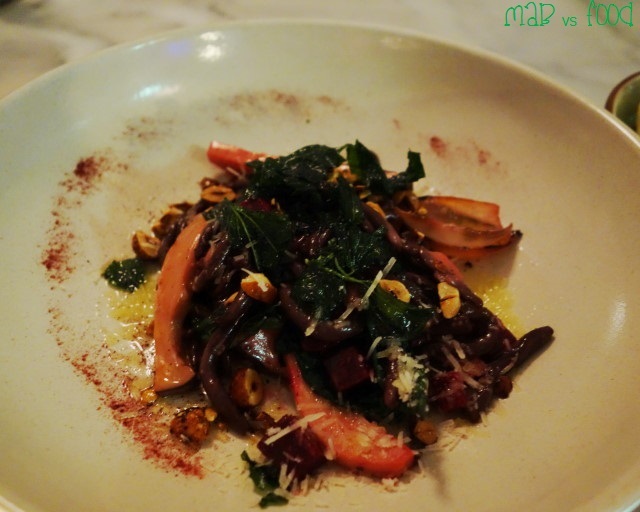 It was certainly an interesting and different dish, but the flavours didn’t hit the mark like the rest of the meal. We were intrigued by the hand-made cocoa pasta, which were more like smooth, slippery strands of soft pasta rather than the al dente pasta that I am more accustomed to. The king brown mushrooms were quite acidic from the vinegar, which did help to balance out the overall richness of the dish. Maybe the dish works better with wild boar ragu and ham hock, which are in the meat version of this dish in place of the mushrooms. 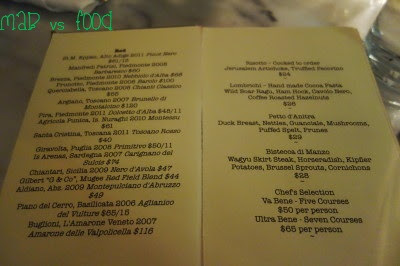 I ordered the wagyu skirt steak and loved it. The cooking of the steak was just brilliant. The steak was cooked medium-rare and had the right amount of bite without being chewy. Actually it was quite tender for skirt. The meat had lots of nice, strong meaty flavours and nicely caramelised from the charcoal grill. And the seasoning of the meat was spot on. Could not fault the steak. 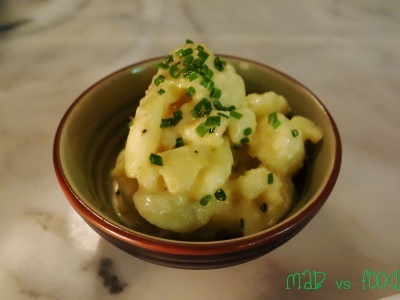 The kipfler potatoes were nice and fluffy with a hint of horseradish for a little bit of kick. I didn’t think the brussel sprouts added a lot to the dish though in terms of flavour. We decided to share just a single dessert this time as we were invited to try some froyo at Mooberry later that night. My first bite of the semifreddo was that the combination of vanilla and thyme is unusual, as I am more used to thyme being used in savoury dishes. The more I ate it, the more the semifreddo grew on me and the more I realised that the semifreddo was just delicious. And you can’t go wrong with the classic combination of strawberries and ice cream. And all the different forms of strawberries in this dessert were enjoyable. Loved the strawberry crumbs for that crunchy texture. And loved the flavours from the strawberry balsamic gel. There were also some almond crisps in the dessert. All in all, an awesome dessert! 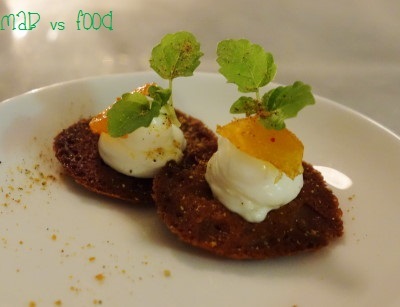 To end a great meal, we were presented with this bite sized treat of white chocolate tuile, sheep’s milk curd and candied cumquat. Lowlight: The restaurant is really small, so some diners may find the lack of space uncomfortable (as evidenced by one man as he was trying to squeeze between me and another table to get to his seat).